Currently blasting west on I40 about to cross into Texas. Right now, the GPS is set for Amarillo, but I expect I will go just west or southwest of there. Should be in Amarillo by 345. Some cumulus is forming across far eastern New Mexico (blue above). I expect these will continue to deepen as ascent overspreads the area this afternoon and evening. Moisture continues to advect into the area. It’s certainly possible to get tornadoes with mid 50 dewpoints in the panhandle, especially considering the overall temp/dew spreads won’t be too high. We need warming to continue west of this boundary, with temps rising into the mid to upper 70s into hopefully low 80s. Amarillo is launching a special sounding this afternoon, so we should get a good look at the moisture depth later. 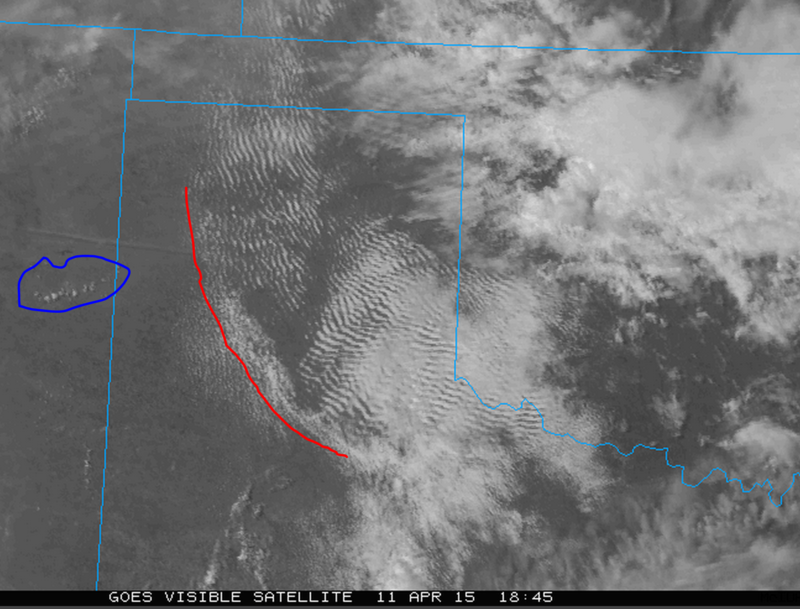 I plan to target initial development west southwest of Amarillo. Any surface based storm will creep slowly along. The outflow boundary may come into play, but it’s not clear. The air on the other side of the boundary is not modified, and is thus very cold and stable. Any storm would have to ride right along the boundary and not cross over. ← Insane Underpass Tornado Video!